So I was in the craft room (aka the front guest room) hoping to find another skein of Lamb's Pride Worsted in RPM Pink, since the skein I'm using for my Very Cabley Mittens apparently wasn't a full one (my Ravelry stash tells me it's 3/4 of a skein -- wish I'd looked there first! ), when I heard something large pull up in front of my townhouse. I looked up and saw this. Luckily for me, the firemen strolled leisurely to one of the townhouses across the street. Peering down to the left, I saw an EMT truck. I guess the firemen were just there for moral support. Eventually, they brought a person out on a stretcher and transferred them to a gurney and then into the EMT truck. I don't know the people who live in the condo they went into. Oh thank god I'm not the only living-room-window-gawker! Hope neighborperson was OK! or you could have grabbed one for me too! Around here for any emergency (well in my little town) you'll have a fire engine show up, several police cars, a guy in a white pickup truck, the ambulance, another emergency vehicle, and at least 10 local volunteers. 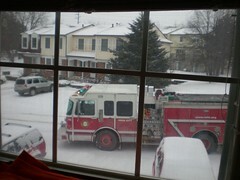 Years ago when I lived in Battle Creek Michigan a fire truck pulled up in front of the house across the street. The woman who lived there called emergency because she had a bat in the house. The firemen took care of the poor little creature for her and I was left to wondering why I was the type of woman who got rid of my own bats (caught them with a fishnet and took them outdoors) and never would have dreamed of calling for professional help.